As term two draws to a close, it has been a great opportunity to gather feedback from my students. Along with my surveys about my teaching, I also wanted to find out my classes perspective on using digital tools. This has been a massive change compared to how they had learnt in their previous classrooms. I use digital tools on a daily basis, and not just Google Apps for Education (such as Docs, Drawing, Slides). While I love teaching using digital tools, I wanted to know what my kids actually thought about it. I have spoken previously about the affordances of digital tools, compared to the traditional and verbal Think-Pair-Share approach. I have always believed that they increase engagement and participation, as they help students to feel comfortable and willing to share their ideas. I also believe the quality of responses is higher. My own opinion on digital tools vs traditional T-P-S proved to be the same as my learners. I posed the question: Do you prefer sharing ideas verbally, or with digital tools? Out of the 16 students who took part in the survey, 15 said they preferred digital tools, while one student said he liked both. because it is faster and because half of the class don't even share there ideas verbally. Because we can share our ideas and I like the word clouds. Because I can see everyone answer. because it easy and a little bit fast. Sometimes I like doing it on both. I like Nearpod because it helps us answer questions on what we learn and you get to write as many words as you can. I like nearpod because it shows your Ideas on the screen. I like using it because we share our ideas with the whole class. I like mentimeter because It has lots of things and its fun. Because you can write more sentences. As Glen Innes School is a part of the Manaiakalani cluster, our pedagogy is Learn, Create, Share. 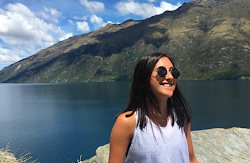 I wanted to focus on the 'create' aspect, and discover how my students really felt about it. After students have learnt something, they use any app they like to create a 'Digital Learning Object' (DLO). Essentially, a DLO is something that is created by the student to show their understanding. A way that it is explained to students is that it can be used to teach somebody else. Therefore, a DLO needs to be clear and easy to understand. 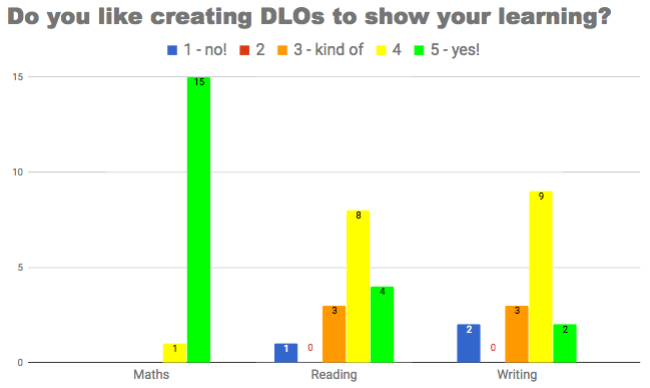 It is pretty clear that my learners love to create DLOs about maths. My class was relatively new to the concept of creating a DLO, so I initially focussed on creating DLOs in maths. Now that they are experienced with creating DLOs for maths, my class absolutely loves it. They are always engaged, and their DLOs are becoming more detailed and articulate. While the response towards creating DLOs for writing and reading is still mostly positive, there are students who either don't like it, or feel impartial. In an effort to boost their enthusiasm, I am working on introducing new tools for learners to use. I wonder whether their lack of exposure to creating DLOs in reading and writing has contributed to some of the students not enjoying it. I am hoping that over time the students will enjoy creating DLOs in reading and writing as much as they do in maths. The most common favourite digital app was Kahoot, followed by Google Apps (Docs, Drawings and Slides) and Canva. Some students chose more than one favourite, which is why there is more than 16 responses. To help make sure these really are my students favourites, next time I would list all the digital tools we have used to help learners pick a favourite. There is a possibility that the students choose these apps because they were spoken about and used in the last two weeks. Cause it's fun playing on kahot! and plus learning from you mistake. Quizzes because you don't have to wait for the teacher to press Next like on Kahoot. I like using them for work because they're easy to use. I like DLO because it helps us what we did for maths. Kahoot because we want to win so it motivates us to read the question carefully and be fast to answer it. Nearpod because I think it helps me understand that it doesn't matter if I get a question wrong, because I'm not the only one who got it wrong. Canva because I get to be creative and make inforgraphics. Kahoot because you can play games and learning games. When students mentioned DLOs I counted this as GAFE because they mostly use Google Drawings and Slides to show their learning. I have copied and pasted the responses exactly how they were written - hence the typos and grammar issues. nothing I like all the digital apps that we use. Socrative because it dose not have funny meme's like quizizz. Kahoot because you have to wait for the teacher to press Next. Mentimeter because I don't like how it is created. none because I like them all. 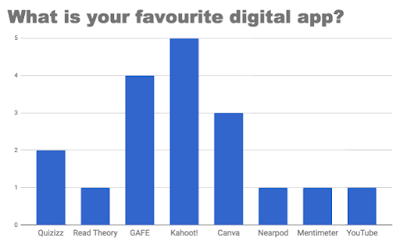 While the majority of students said they don't have a least favourite digital tool, the next most common response was AnswerGarden. I think this is interesting because their reasons is one of the reasons why I personally like AnswerGarden. Because of the word limit, AnswerGarden forces respondents to be succinct. This can be a challenge for students. It is great to see that the response to digital tools is mostly positive. Digital tools help to increase student engagement, as they are more willing to share ideas and collaborate on tasks. 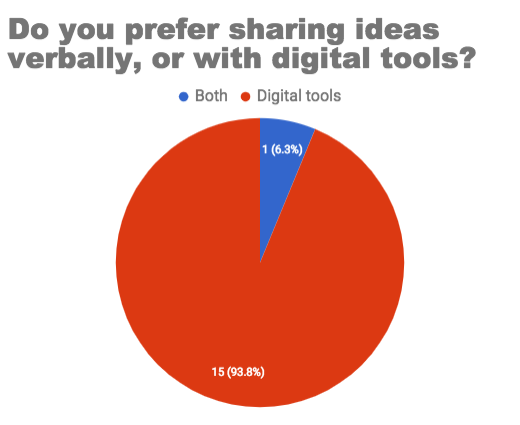 My survey has also shown that the class prefers using digital tools over traditional verbal methods of sharing and collaboration. I will continue to expose my learners to new and exciting digital tools, as I think this will help them to become more comfortable with using them.